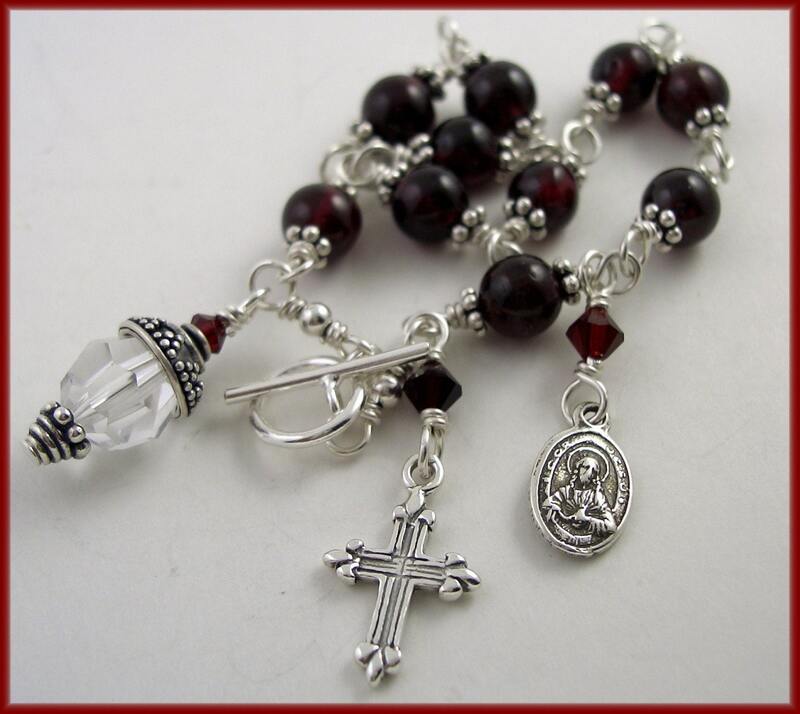 The appropriately-named Mary of marysrosegarden.etsy.com specializes in handmade wire-wrapped sterling silver and semi-precious gemstone rosary bracelets, rosaries and chaplets. She has also added car rosaries and key chains made with silver-plate wire and Czech fire-polished beads. She has a very busy schedule (In her words, she is "a mom, registered nurse, chief cook and bottle washer to a drag racing team, owned by a giant Newfoundland dog, and tolerated by 2 cats! "), so I was pleased that Mary took the time to talk to us. My son gave me my first rosary bracelet. He snuck out of church and purchased it with his lawn mowing earnings. It was a little pewter bracelet and I wore it until it fell apart. I enjoyed wearing it and decided to look for something more like a piece of jewelry and more strongly made. I became intrigued with the wire wrap technique and decided to try my hand at that. Having no experience in working with wire, I scoured the Web and found some "how-tos". I rummaged through my daughter's craft stuff and found some beads. Then off to the garage to find some wire and pliers. Sitting at the kitchen table, working late into the night, trying to get the hang of it! Let me tell you, it's not as easy as it looks! After much practice, and exhausting a whole roll of wire, I was ready to attempt "the real thing". Wow! It was a whole other world! Thousands of choices of beads, wire, finding, it seemed endless. That's when the real education started. I understood "sterling silver", but "dead-soft", "hard-hard"? And what in the world is a gauge? Now let's talk about semi-precious gemstones! Who knew there were so many types of rocks in the world. Not to mention quality, size, and cut! Did you know that fresh water pearls are formed by mussels? I have learned so much! Satisfied with my handiwork, I began wearing my bracelets. Friends and strangers commented on my work and that's when I started offering them for sale. I've been gratified by the response to something that I really enjoy doing! A tough question! (Well, drag racing isn't it, but don't tell my husband!) I really enjoy photography and spend a lot of time at that! Alas, I do end up taking lots of pictures of dragsters! Time, time, time! There is never enough time! Trying to get a handle on promotion has really been the biggest challenge of all. I would really like to have a Connemara Marble bracelet! I haven't made one for myself and would really like to have one! I just love all the shades of green! I always wanted to be a nurse, and I'm doing it! I knew the ballerina thing would never work out! I have been awed by the many talented people on Etsy. Every day I find something new and wonderful! Here are just a tiny portion of my "favorites" list! I'm in a really good spot right now! I'm slowly getting my bracelets out there and have had a really good response, so far! I am toying with the idea of silversmithing! Who knows!